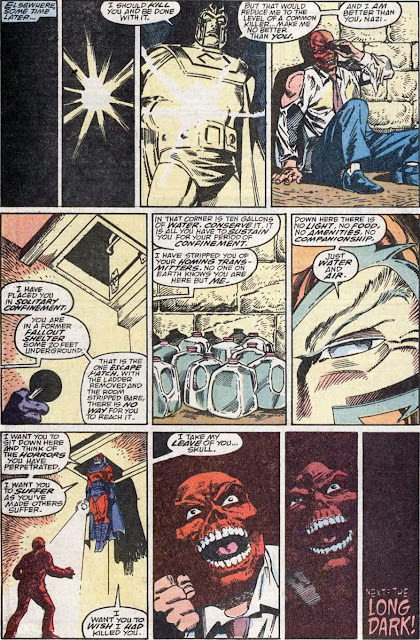 The standout scene from the Acts of Vengance crossover kicks off with the Red Skull smug in his hideaway, arrogantly detesting his 'allies' when Magneto decides to school him on how to make an entrance. 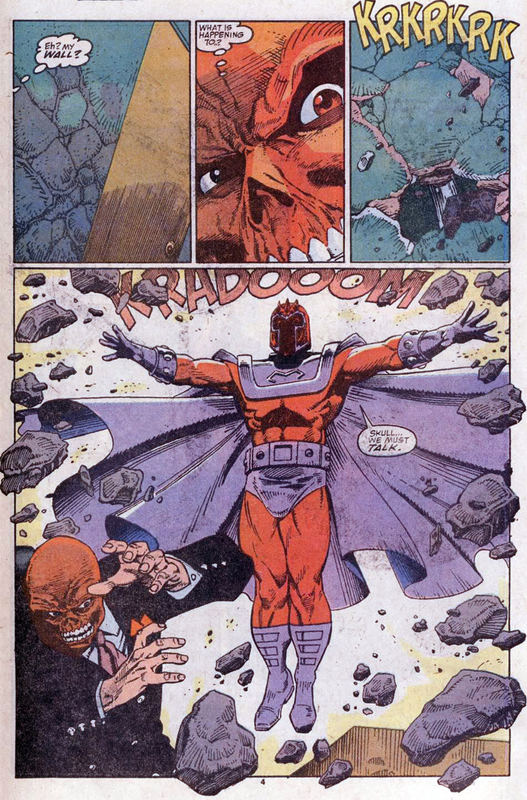 Lurching for the bone-faced dictator at the suggestion of burying the past, Magneto's force-field is all that prevents him from been gassed by the Skull, who exhales poisonous vapours into his face. ...and exit the Controller. Having just dished out the biggest two panel slap-down in comics history, Mags continues on. 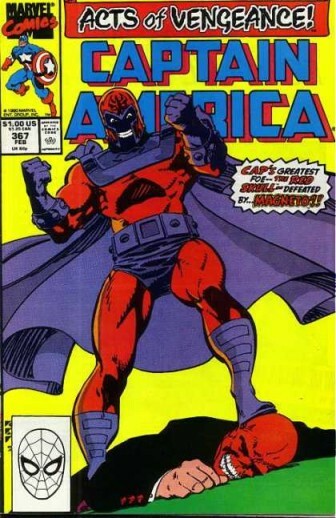 For the full showdown between these titans of terror, including all the cool bits and pieces not shoved up here, track down your copy of Captain America #367 Magnetic Repulsion, next time you are at a back issue bin, by it's awesomely identifiable cover. oh good pick Dan! i never owned it but i read this issue some time ago. talk about some not so subtle overtones and dueling perspectives of morality. but the difference between the two is that Magneto has his experience as a concentration camp victim and as a persecuted mutant to explain his motivations. 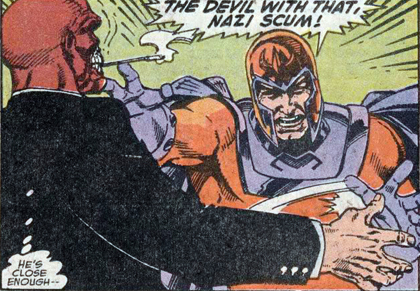 where as the Red Skull is all about nazi psycho babble ideology. one is redeemable, the other is not. Thanks David - glad you liked it! You are right there are two different motivations at work there. 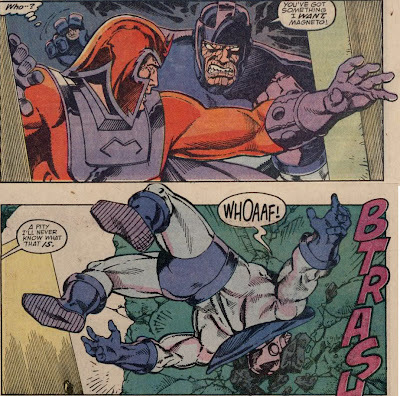 Marvel dined out on the 'Magneto sunk my battleship' line for quite a while back in the day, but in the actual event, it wasn't as cut and dry as it sounds. Red Skull on the other hand... well... yeah. As always - thanks for the comments! Those last two panels with the Red Skulls face fading into the dark always leave me with chills. Thank you so much for digging this up. I haven't read it since I was little girl. 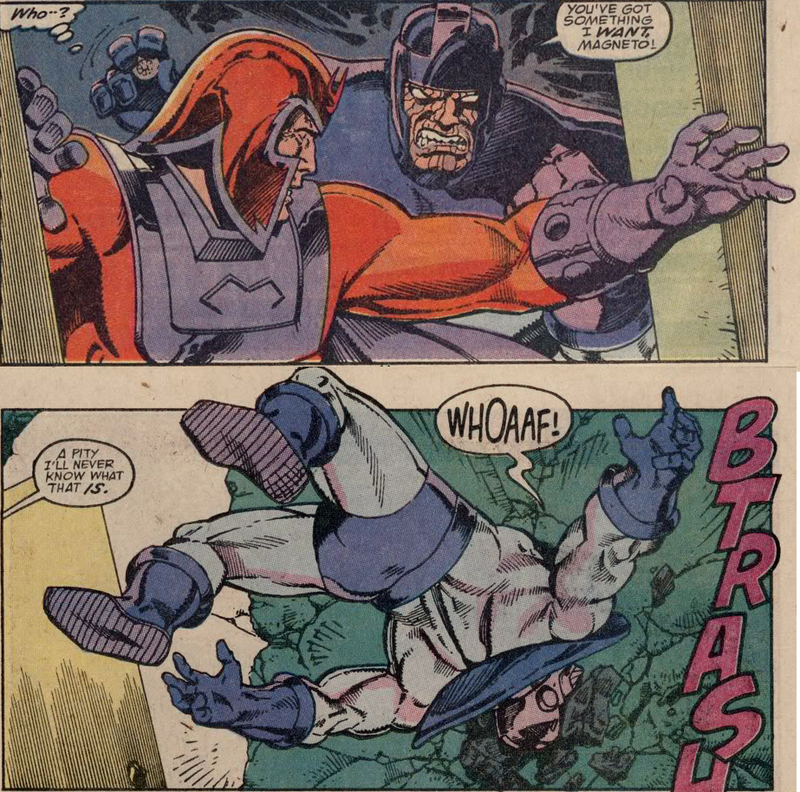 I think it was the first time I was ever completely on Magneto's side and rooting for him. By the way, David H. sent me. Thank you David. I think that's part of what makes Mags a great villian don't you randomnerd? You can kind of see where he's coming from in some ways. Like Ra's al Ghul. Because of this I was excited to see Magneto #1 in Marvel's January solicits, but it was only a one-shot. Seems like someone missed the boat there.